- Added a new monster: the Night Stalker, with a medium-low level and a fixed place in the world. - In the Clash of Swords you’ll also get a Necromancy Book and you won’t need reagents to use it during the event. - The durability of the ice weapons and armors has been increased another 50%. - The Werewolves won’t give the full armor anymore. They will now give enough skin to craft a full armor, that can only be crafted by a professional Tailor. - Ethereal Jewels that appear on the level 7 of Treasures and on Deceit will now have a higher medium level than those got by other methods. - Weapons and armors in a vendor now won’t wear out during the first 4 weeks, provided that the vendor has 100 items max, including bags and their content. When you open the vendor stock now you’ll see a message telling you how many items the vendor has, so it’s easier to control this limit. If the item already was on a vendor and it’s placed for sale again, the counter will continue from where it was. - The Donation Merchant has been substituted for a new system to transfer Donation Items easily from player to player. The prices will be the same as before, when we were doing the transfer through the Staff (20% of the value of the item, with a minimum of 2 euros). The system will only allow one item pending to transfer, both for the player who send and the player who receives. This system allows to ask the player who receive the item to make a payment both in gold coins and Donation Checks. Any payment in Donation Checks made in this system will return exchange, so you don’t need to have the exact amount of Checks. The old Donation Merchant will remain for another 60 days to allow the players who have any gold amount or any item pending to retrieve them. After this 60 days, any iterm or amount pending to be retrieved will be lost. - In this new system you’ll be able to transfer Donation Checks and ask an amount of gold coins in return. The price to use this system will be 5.000 gold coins and the money will be put in a check in the bank of the seller. - We’ve added a board to see the historical Hall of Fame with the winners of every year since 2005, when we added the automatic events system. - From now on you will receive a mail on the mail address you registered your account with if your house is less than 5 days left to disappear, so you can refresh it. - The Alchemist will now give parts of scrolls with parts of formulas that will work on the Transmutation Chest. There will be also a new item (Macabre Book) that can be crafted with 100 Tailoring and 120 Inscription (110 Powered Up), an Igneous Herb, a Pile of Leather and 20 Blank Scrolls, that will allow you to collect and order the clues. - The penalty for drinking Absolute Potions will now decrease much slower than before because there wasn’t a true difference in the time to drink the next potion unless you drank the potions too, too quick. - Premium Guilds will now be able to personalize for all their guild members the color of the armor and the appearance of the helmet and shield for matched 1vs1 tournaments. - Mages will now equip a leather armor instead of plate armor in Color War with Magic. - The .cw_status command has been disabled for every event but Capture the Flag (where it is used to know the current team scores). This command was added when the dead players had to wait until the event was over before being able to do other things and has no sense anymore. It was being used to inform the players that were fighting about the battle status, and the players inside the battle don’t have to know that information. - And the last change is a very special one: we’ve added the possibility to change the doors of the houses. A Carpenter will be able to craft them both with regular wood and special wood, and a professional Blacksmith with Powered Up Carpentry (102) will be able to craft them made of metal too. A padlock will be necessary to craft all kind of doors. Once the doors are crafted a deed will be created and you can change them with 106 Lockpicking. 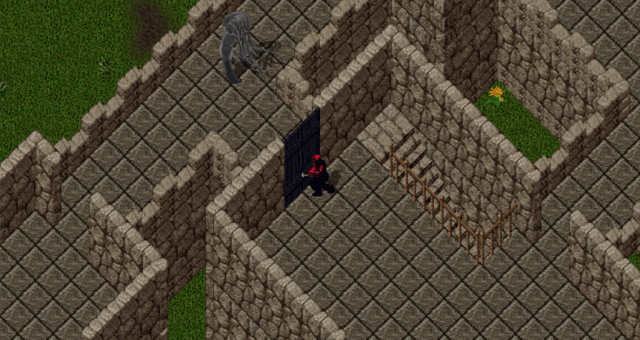 With 112 Lockpicking you’ll also be able to add new doors on Stone Keeps and Castles in the positions where there is a free spot exactly for two doors. I hope you like all these new features, and I promise to keep working so the small light in the World of Dread keeps brighting for a long time.